Scotch broom makes me nauseous. Roses make me sneeze. I abhor the scent of jasmine on an evening breeze. Room deodorants should be banned, as should scented candles. I’d rather smell my brother’s sneakers or a vagrant’s sandals. there’s a different odor on everything we’ve got. There’s perfume in detergent, in dryer tabs and soap. Scented toilet paper makes we want to mope. Unscented’s getting almost impossible to find. It leaves allergic folks like me in a real tight bind. Gardenia in my hand lotion or chamomile or peach. Hairsprays smell as fresh as air or like a summer beach. as though without this pungent scent our floors would smell like swine! These odors leave me gasping and running for some air. Their vapors make my eyes run, causing much despair. I believe that everything should smell as nature meant. that perfumes out-stink everything they’re meant to obscure! The prompt today was fragrance. I found at least five old poems about fragrances and odors. Here’s another one that goes waaaay back. 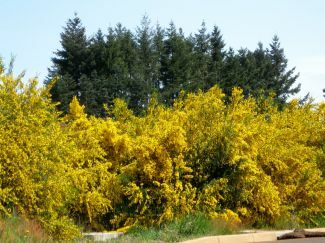 Image of Scotch Broom from the internet. This entry was posted in Allergies, Smells and tagged Daily Post, Daily Prompt, fragrance, Odors, poems about fragramces., poems about odors, Scotch Broom, Smells on July 24, 2017 by lifelessons. sends me off in paroxysms—sneeze on sneeze on sneeze. Lilacs give me headaches, tuberoses make me ill. Whenever dates wear aftershave, I have to take a pill. Pinesol makes me nauseous. I’d rather smell the dirt! And please do not use fabric softener on my favorite shirt. for they’re another stinky thing I simply cannot handle. and tell their friends to do the same, ‘cause I have these strange notions. What I like to smell is dill, and soil soaked by rain. The kind of things I like to smell I’m hard-pressed to explain. Who likes the scent of curry or cabbage in the hall? But I admit, I like them! They don’t bother me at all. I love the smell of Popsicles—my favorite is cherry. It’s floral scents that I abhor, so weddings make me wary. I hug the bride and kiss the groom, contribute to her trousseau. But I must always hold my nose and hurry as I do so. Orange blossoms are the worst, along with the carnation. Even roses, I admit, are an abomination! I really do like flowers, but only how they look. My favorite kinds of odors are kinds that you can cook! are smells that inspire ecstasy—that certain little thrill. swirl around my nostrils and end up in my head. of culinary orgasms and itchings they will quell. leave the flowers at the shop and simply bring me cake! Daily Prompt: Nosey Delights—From the yeasty warmth of freshly baked bread to the clean, summery haze of lavender flowers, we all have favorite smells we find particularly comforting. What’s yours? This entry was posted in Allergies, Flowers, Poem, Poetry, Scents, Smells and tagged Allergies, Daily Life, Daily Prompt, Favorite Smells, flowers, humorous poetry, Judy Dykstra-Brown, Judy Dykstra-Brown Poetry, Odors, poem, Poems, Poetry, Poetry by prescription, Scents, Verse, writing on July 17, 2014 by lifelessons.